Corporate wellness in Ireland has developed year on year as more and more companies are making a serious commitment to promoting employee wellbeing in the workplace. One of the key corporate wellness trends in Ireland in 2018 has been the movement towards more holistic corporate wellness programmes. That is a focus on personal wellbeing as an aggregate of many intersecting factors such as physical fitness, nutrition, mental health, personal growth and emotional and social wellness. Financial wellbeing needs to be addressed within this employee health and wellbeing eco-system if the vision of a holistic corporate wellness programme is to succeed. in this article. we’ll look at the main ways in which employee financial wellness impacts the overall health and wellbeing of an employee. Stress is the number one enemy of workplace wellbeing. Traditionally, many corporate wellness plans have set out to reduce the impact of stress on employees by offering relaxation, stress management, and ancillary corporal health supports. But this only addresses the effect of stress, when really we need to look at the cause. Financial stress is common amongst employees, and the impact this can have on employee health and wellbeing is staggering. As detailed in a previous article on financial stress on this blog, research coming from America has identified a disorder called ‘Acute Financial Stress’ comparable to Post-Traumatic Stress Disorder (PTSD), with symptoms affecting both physical and mental health. Treating the root cause of financial stress is not a case of offering employees more money. It’s about educating and empowering employees to take control of their financial circumstances through effective financial planning. Here’s where qualified financial planners come in to support employee financial fitness. While a financial wellness one on one coaching session may not be as relaxing as a workplace massage or a spot of desk yoga, the benefit to the employee may be far longer lasting. While financial stress in and of itself can result in adverse medical conditions, there is a secondary consequence of financial stress on employee health and wellbeing: ignoring health issues in order to avoid medical expenses. People who find themselves short on cash each month are more likely to allow small medical issues to escalate by not treating them early. Moreover, lack of control over one’s month to month finances can result in poor decision making around long-term financial cover such as adequate health insurance. Having enough spare income each month to cover small ad hoc medical expenses or a rainy day fund for more serious events is crucial for employee financial fitness. So too is choosing the right health and life cover to protect the employee and their family during times of serious illness or injury. Financial fitness programmes about budgeting effectively for everyday life and planning for future events, including cover for unexpected ones. The financial fitness model determines that disposable income is what is left over from one’s income after the cost of living and the cost of financial planning is deducted. Disposable income is what you have left over to, for want of a better phrase, do what you like with! For some people (and their dependents) it could be soccer or scouts or socialising. For others, it could be adventure sports, visiting spas or art museeums or spending time with family. Disposable income is what you can afford to spend each month after other costs and responsibilities are taken care of. And so, in financial fitness terms this pot can be referred to as the wellbeing income. It should be spent on items and activities that promote personal and family wellbeing – personal growth, social, emotional and physical health. And there should be no guilt attached to it! Employee financial wellness programmes can help to carve out this pot of wellbeing income so that employees are set up to cover the cost of living as well as living well -by doing the things they like to do. Corporate wellness programmes need to be holistic because all aspects of employee wellbeing have a knock-on effect on each other. So it goes with financial wellness. Employee financial wellness programmes help employees to take control of their finances so that they are comfortable, healthy and happy in the short term and secure and protected for the future, including unforeseen illness or injury. 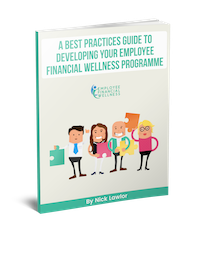 In this guide I want to help you to develop the best possible Financial Wellness Programme for your company by sharing industry best practices with you. These Best Practices are taken from my own experience as an Employee Financial Wellness provider and are intended for companies that have a medium to large sized workforce.